Although the words setup and alignment are often times used interchangeably, there is a difference. First, setup typically refers to fundamentals at address position. For example, posture, stance, grip, ball position, hand position, and spine angle. 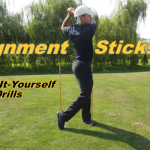 All are essential in the recipe to better golf and better alignment. When the body is setup correctly good alignment is easy and almost a given. What you need is a mirror, alignment sticks or a second pair of eyes. Today’s video will give you a fool proof practice plan to achieve a better setup and alignment for pin point accuracy.